As parents and teachers, we all want our children to have a happy, healthy lifestyle. In saying this, we must also show them what this means. Risk factors for chronic illnesses are not limited to just us adults. Remaining physically active (for both adults and children) leads to better fitness, stronger bones and muscles, lower body fat, and even fewer symptoms of anxiety and depression. In more simplistic terms, it builds a better you! At every age, mix of activities, time spent and intensity are important. Around 3-4 years old, children start to develop the coordination needed to participate in organised activities (such as martial arts). The older your children get, the more co-ordinated and fitter they get. They can do more with their bodies and they can train for longer. This is why we purposely structure our classes to introduce certain martial arts techniques at the right stage of their age / development. At around the teenager level, the greatest gains in bone mass occurs. Weight-bearing exercises like martial arts, running and weight lifting jumping help build a strong skeletal structure. Parents are always the best role models. If you lead an active life, you inspire your children to do the same. We often find our longest serving martial arts students / teachers are the ones that come along as a family. As the ancient Samurai used to say, “the family that trains together stays together”. Playing chase, such as hide and seek, touch footy, etc. And one more time, martial arts. Find at least three 30-45 minute slots for physical activity each week. 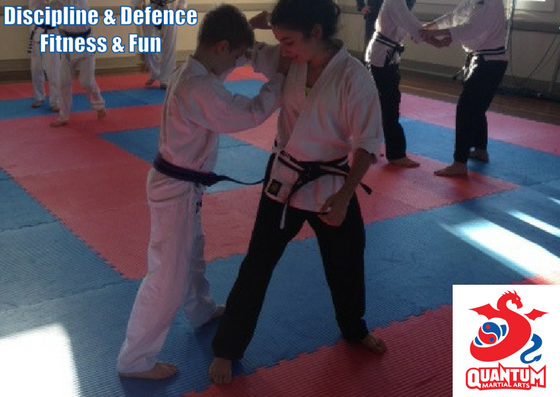 This is the perfect amount of time for a martial arts class or any other activity that your child enjoys. . Pick at least one of those slots as family activity times. Playing on the computer. It is an easy habit to pick up, but is affects fitness levels, concentration and sleep patterns. This can help them build friendships. As an instructor, I always like seeing the students build friendships that last outside the dojo. With some of the strong friendships, you do not always pick them in advance either. Therefore, the students are making lifelong friendships with people from all walks of life. Find recreational, team and individual sports they enjoy. I believe that martial arts encapsulates all of this in the one activity. Help your children try activities that do not always require extreme athletic skills, such as jogging, cycling or swimming. This can encourage everyone to take part and keep up the good work. Oh, did I mention martial arts earlier? Sharing your physical activity with friends and family is a great social activity. Consider inviting your friends to exercise with your family. Pencil in activities in your family’s social calendar. We find a lot of people refer others to our martial arts classes, which is a great way to stay fit and stay in contact with family and friends. Take family walks. I love walking the around the neighbourhood. It is a good chance to get out of the house, chat and connect with your own family (it beats sitting in front of the TV). I also like walking after a meal to help with digestion. Cycling, rather than driving, to the shops. Before starting regular physical activity, always check with a doctor or health professional about the right levels for your family, particularly if there are any medical issues.